Taking the concept further it has been shown in the IMPaCT study that this approach can be successfully embedded into normal primary care. The STarT Back approach is used widely in the UK and and continues to be adopted internationally. 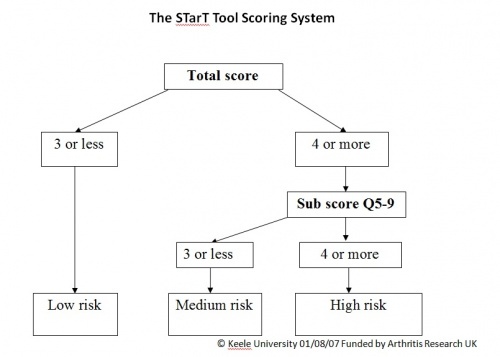 The Keele STarT Back Screening Tool (SBST) is a simple prognostic questionnaire that helps clinicians identify modifiable risk factors (biomedical, psychological and social) for back pain disability. The resulting score stratifies patients into low, medium or high risk categories. For each category there is a matched treatment package. The SBST 9 item tool has 9 questions about predictors for persistent disabling back pain. They include radiating leg pain, pain elsewhere, disability (2 items), fear, anxiety, pessimistic patient expectations, and low mood and how much the patient is bothered by their pain. All 9-items use a response format of ‘agree' or ‘disagree', with exception to the bothersomeness item, which uses a Likert scale. The Keele SBST produces two scores: overall and distress (psych) subscale. These are used to stratify patients into low, medium and high risk groups which have their respective matched treatment packages. The patient is asked to think about the last 2 weeks and tick "disagree" or "agree" for questions 1-8 and then give a scale for question 9. "It is not safe for a person with a condition like mine to be physically active"
"Worrying thoughts have been going through my mind a lot of the time"
"I feel that my back pain is terrible and it's never going to get any better"
"In general I have not enjoyed all the things I used to enjoy"
How bothersome has your back pain been? The 9-item SBST Clinical Measurement Tool is designed to help clinicians objectively measure the severity of the domains screened by the 9-item tool. When repeated measures are used this enables an objective marker of change over time to be made for individual items. Its very easy to produce an acetate using these cut-offs that you place over the questionnaire to quickly enable you to score the clinical measurement tool for subgrouping purposes. The STarT Back approach uses the STarT Back tool to stratify patients with back pain into low, medium and high risk groups for ongoing disability. For each group there is a different treatment package matched to their level of risk. The patients in the low risk category are very likely to improve. The aims of this package are to support and enable self-management. The key factors are to address patient concerns and to provide information. This builds on the assessment from the low risk package. The main aims are to restore function (including work), minimise disability even if pain is unchanged and to support appropriate self-management. This is the risk group that we are most likely to use usual physiotherapy treatments with as directed by guidelines. Specific physiotherapy interventions when clear specific findings from physical assessment (i.e. manual therapy, specific exercises). This again builds on the low and medium risk packages. The aims are to reduce pain, reduce disability and improve psychological functioning. The physiotherapists delivering the high risk package have additional training, mentorship and ongoing professional support to enable them to elicit and address more complex issues in patients who often have additional psycho-social barriers to recovery. It is important to emphasis that the physiotherapists also provided physical treatments to these patients as required. Myotomes– rise from a knee squat (L3/4), walk on heels (L4/5) and walk on toes (S1/2). Prognosis: low risk – excellent, medium risk – good but guarded, high risk – suggest hope for improved function but don’t promise cure pain. Morsø L, Albert H, Kent P, Manniche C, Hill J. Translation and discriminative validation of the STarT Back Screening Tool into Danish. Eur Spine J. 2011 Dec;20(12):2166-73. Epub 2011 Jul 19. Hill JC. The early identification of patients with complex back pain problems. The Back Care Journal. Spring 2010. Fritz JM, Beneciuk JM, George SZ. Relationship between categorization with the STarT Back Screening Tool and prognosis for people receiving physical therapy for low back pain. Phys Ther 2011;91:722–732. del Pozo-Cruz B, Parraca JA, del Pozo-Cruz J, Adsuar JC, Hill JC, Gusi N. 2012. An occupational, internet-based intervention to prevent chronicity in sub-acute lower back pain: A randomized controlled trial. Journal of Rehabilitation Medicine. vol. 44(7), 581-587. Field J, Newell D. Relationship between STarT Back Screening Tool and prognosis for low back pain patients receiving spinal manipulative therapy. Chiropr Man Therap. 2012 Jun 12;20(1):17. Beneciuk JM, Bishop MD, Fritz JM, Robinson ME, Asal NR, Nisenzon AN, George SZ. The STarT Back Screening Tool and Individual Psychological Measures: Evaluation of Prognostic Capabilities for Low Back Pain Clinical Outcomes in Outpatient Physical Therapy Settings. Phys Ther. 2012 Nov 2. Wideman TH, Hill JC, Main CJ, Lewis M, Sullivan MJ, Hay EM. Comparing the responsiveness of a brief, multidimensional risk screening tool for back pain to its unidimensional reference standards: The whole is greater than the sum of its parts. Pain. 2012 Nov;153(11):2182-91. N Foster & A Delitto. Embedding Psychosocial Perspectives Within Clinical Management of Low Back Pain: Integration of Psychosocial Informed Management Principles into Physical Therapist Practice - Challenges and Opportunities. Physical Therapy 2011.